The current tour, featuring songs from the band’s Nonesuch Records debut album, Side Pony, features stops in DC, Atlanta, New Orleans, Houston, Fort Worth, and Austin, then picks up again in August. For details, visit nonesuch.com/on-tour. To pick up a copy of Side Pony, head to iTunes, Amazon, or the Nonesuch Store, where CD and vinyl orders include a download of the complete album at checkout, and the 96kHz/24bit HD digital album is also available to purchase. It’s been a busy year of milestones for Lake Street Dive since the February 2016 release of Side Pony on Nonesuch Records. The band was invited to play at the White House, sold out 42 shows in 2016 throughout the United States and were musical guests on The Late Show with Stephen Colbert and The Today Show. Lake Street Dive was featured on Chris Thile’s hosting debut of A Prairie Home Companion, among many other high points that include sold-out shows at the iconic venues like the Wang Theatre in Boston and Radio City Music Hall in New York. Upon its release the album was #1 on the Alternative chart and #11 on the Billboard Album Sales chart. To Lake Street Dive, the title, Free Yourself Up, is both an exhortation to listeners and a statement of purpose for the band. In many ways, this is the band’s most intimate and collaborative record, with the band working as a tightly knit unit to craft its ten songs. For this album, the quartet drafted touring keyboardist Akie Bermiss to join them in the studio as well as on stage. Adding another player to the process freed up the the band members to explore a wider range of instrumental textures, construct more full-bodied arrangements, and build on their well-known background harmonies. Every ticket purchased online for Lake Street Dive’s headline shows includes a CD of the new album Free Yourself Up, released on 5/4/18. Instructions for redeeming albums will be sent via email shortly after ticket purchases. Lake Street Dive shares a video for the new song “I Can Change” from their forthcoming album, Free Yourself Up, due May 4 on Nonesuch. The band also announces more North American stops on their international tour, which begins with an intimate show at The Sinclair in Lake Street Dive’s original home of Boston on the album’s release day and continues with more than fifty additional performances. Newly added tour cities include Cleveland, Portland, Atlanta, Austin, Memphis, Chicago, and more. Tickets go on sale on Friday, April 6, available at lakestreetdive.com. During this tour, the majority of tickets purchased online for headline shows will include a Free Yourself Up CD. The intimate video for “I Can Change” puts singer Rachael Price front-and-center as she is carefully put through numerous wardrobe changes, emphasizing the physical and metaphorical changes she sings about in the song’s lyrics. The video was created by filmmaker Claire Marie Vogel. Free Yourself Up is Lake Street Dive’s second album on Nonesuch Records. The four-member band-drummer Michael Calabrese, bassist Bridget Kearney, singer Rachael Price, and guitarist/trumpeter Michael “McDuck” Olson-produced the album themselves at Goosehead Palace Studios in Nashville with engineer Dan Knobler. 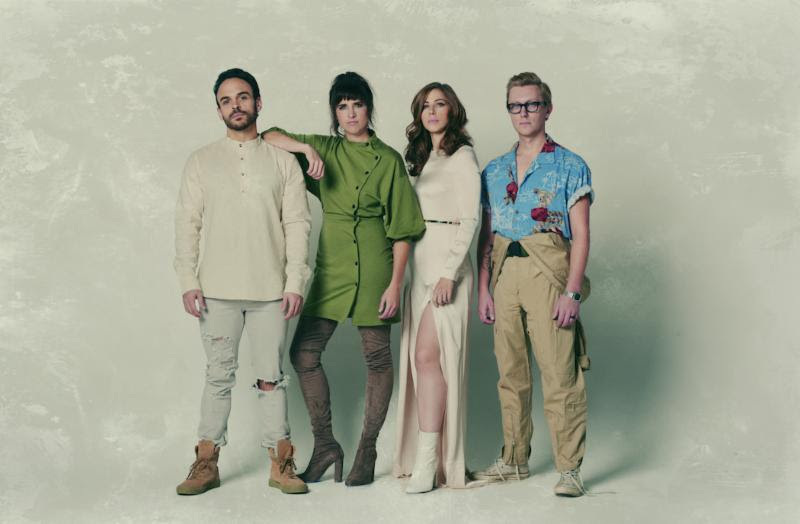 Free Yourself Up is available to pre-order now at iTunes, lakestreetdive.com, and nonesuch.com, where the album tracks “Good Kisser” and “I Can Change” are available for instant download; Nonesuch Store pre-orders also include an exclusive print autographed by the band. The band recently shared the video for “Good Kisser”, recorded at Goosehead Palace Studios, which can be seen here. To Lake Street Dive, the title, Free Yourself Up, is both an exhortation to listeners and a statement of the band’s purpose. In many ways, it is their most intimate and collaborative record, with the band working as a tightly knit unit to craft its ten songs. For this album, the quartet drafted touring keyboardist Akie Bermiss to join them in the studio as well as on stage. Adding another player to the process freed up the band members to explore a wider range of instrumental textures, construct more full-bodied arrangements, and build on their well-known background harmonies. Last night on Conan, Lake Street Dive performed the hit single “Good Kisser” from their new album Free Yourself Up, which was released on Nonesuch Records Friday, May 4. See the performance here. Yesterday was also the band’s sold-out show at Ford Theater in Los Angeles. Free Yourself Up debuted at No. 4 on the Top Album Chart and No. 8 in the Billboard Top 200 Chartwith 31,824 units sold (of which 30, 459 were traditional album sales) – a first for the band, and their highest sales week to date. Their previous album Side Pony debuted in 2016 at No. 11 on the Top Album Chart and No. 29 on the Billboard Top 200 Chart, and before that Bad Self Portraits debuted in 2014 at No. 18 on the Top Album Chart. “Good Kisser” has been in the Top 5 at Americana radio for more than a month and is currently in the Top 20 and climbing at AAA radio, both career peaks for the band. On album release day, the group shared a new music video for “Good Kisser“, directed by Bianca Giaever. Lake Street Dive has also recently performed for NPR’s Night Owl, CBS This Morning – Saturday, as well as the Late Show with Stephen Colbert. Free Yourself Up is available to purchase now at iTunes, lakestreetdive.com, and nonesuch.com,and to stream at Apple Music and Spotify. This is Lake Street Dive’s second album on Nonesuch. The band-drummer Michael Calabrese, bassist Bridget Kearney, singer Rachael Price, guitarist/trumpeter Michael “McDuck” Olson, and recently on-boarded keyboardist Akie Bermiss-produced the album themselves at Goosehead Palace Studios in Nashville with engineer Dan Knobler. To Lake Street Dive, the title, Free Yourself Up, is both an exhortation to listeners and a statement of the band’s purpose. This can be heard, most notably, in the anthemic track “Shame, Shame, Shame” and it’s manifesto that “change is coming…Ain’t no holding back. Ain’t no running.” In many ways, it is their most intimate and collaborative record, with the band working as a tightly knit unit to craft its ten songs. For this album, the quartet drafted touring keyboardist Akie Bermiss to join them in the studio as well as on stage. Adding another player to the process freed up the band members to explore a wider range of instrumental textures, construct more full-bodied arrangements, and build on their well-known background harmonies. The band’s international tour is well on its way with more than 60 performances scheduled, many of them already sold out. Tickets are on sale now at lakestreetdive.com. Unless noted as a ‘non-bundle date’, every ticket purchased online for Lake Street Dive’s headline shows will include a CD of the new album Free Yourself Up, to be released on 5/4/18. Instructions for redeeming albums will be sent via email shortly after ticket purchases. Lake Street Dive announces new tour dates for January 2019 in support of their album, Free Yourself Up. Following a successful run of more than eighty performances this year, many of which sold out, shows in the New Year include Charlotte, Orlando, Birmingham, New Orleans, and more. Tickets go on sale to the public on Friday, October 5 via lakestreetdive.com. While in New York City next month, the group has two major headlining performances scheduled for the Beacon Theater, on November 5 and 6. They will then be honored for their support of music and arts education at the tenth annual Little Kids Rock Benefit on November 8 at The Playstation Theater in Manhattan. Then on November 12, Lake Street Dive sits down for a conversation with one of their biggest fans, Stephen Colbert, celebrated host of CBS’ Late Show, and plays a few songs live at the sold out 92nd Street Y. 92nd Street Y is a world-class cultural community where people from all over the world connect through culture, arts, entertainment and conversation. More info is available here. Free Yourself Up came out in May of this year to critical and popular acclaim, spending a nearly unheard of seven and a half months on the non-commercial radio charts and an equally rare eighteen weeks on Billboard’s Top Current Albums chart. Free Yourself Up originally debuted at No. 4 on the Top Album Chart and No. 8 in the Billboard Top 200 Chart– a first for the band, and their highest sales week to date. The lead single “Good Kisser” was in the Top 5 at Americana radio for over a month while continuing to find success in the Top 20 at AAA radio. The band has also performed for NPR’s Night Owl, CBS This Morning – Saturday, as well as the Late Show with Stephen Colbert and CONAN. For more information on Lake Street Dive and tour updates, visit lakestreetdive.com.